Announcing the completion of this mid-century sofa is so gratifying! It always feels amazing to complete a piece and see the transformation come full circle. Whenever I take on reupholstering a piece of furniture, it's always a mystery of what is really going on underneath it all and how much work will really be required. Here's a look at the before, during and after! Chris found this sofa at Lounge Lizard, the owner knew it needed lots of work, (it was missing the cushions) but the legs on this sofa were too good to pass up. We thought so too and knew that this would be our next project. First, I considered adding cushions, but thought that would make the seat too high in proportion to the arms. Must improve the seat so that it is actually comfortable. The arms were saggy in the middle and way too stiff (I had a hunch that there was dehydrated foam underneath). I really disliked the middle part of the arms, I knew that there must be another more modern way to finish the arms. This sofa really is easily a three-seater and I didn't like how the piping was cut down the middle. I love how buttons always make furniture seem so much more polished and professional, I thought that must be the answer for back. It came with this amazing label attached to the bottom, however, we haven't been able to find out too much about it. 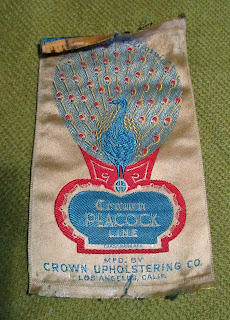 Crown Peacock Line of the Crown Upholstering Company, Los Angeles, Calif. Here I am in the sofa stripping process. Yes, I'm wearing a mask and gloves. I usually haven't done this in the past and have reaped the consequences of constant sneezing, so I finally wised up and wore proper gear. It helped so much! One of the most interesting parts about tearing this sofa apart is that not a single staple was used. Only tacks were used, making me think that this sofa must have been made in the late 40s/early 50s. This is the first project I've encountered no staples. It was surprisingly refreshing! (Tacks are much easier to take out.) Also, much thanks to Chris, we worked together throughout this step and it made it go so much faster! It's great working on projects together. After stripping the sofa, we went on the hunt for the perfect fabric. We both liked the idea of an olive or chartreuse green or a deep orange. 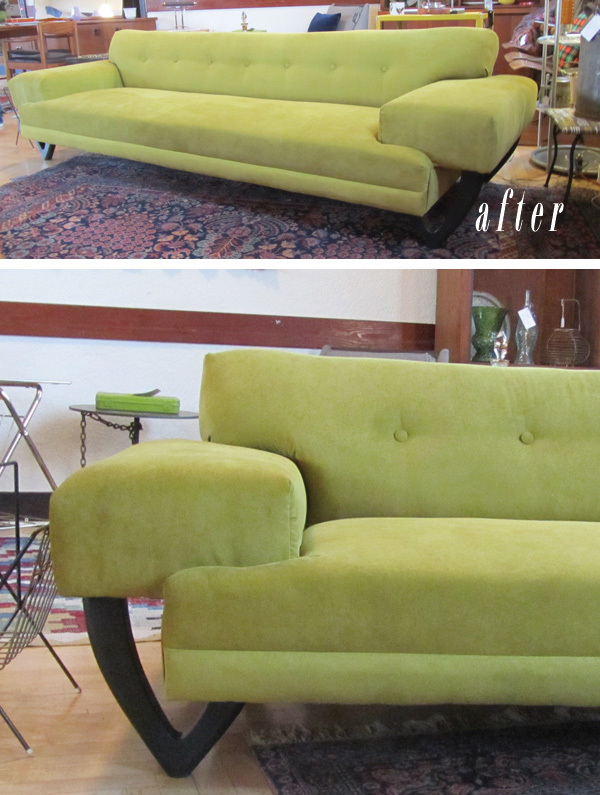 After a few spots at the local shops around town, we decided on this chartreuse upholstery fabric. It's really hard deciding on the fabric, especially since it won't be for us. Also, since this sofa is so big (Over 8 ft long), it's hard to visualize. I've actually used it before on this chair, so I thought it was a safe bet for this sofa. After choosing the fabric, we started rebuilding with new foam and dacron (this is an upholstery type of stuffing/batting). 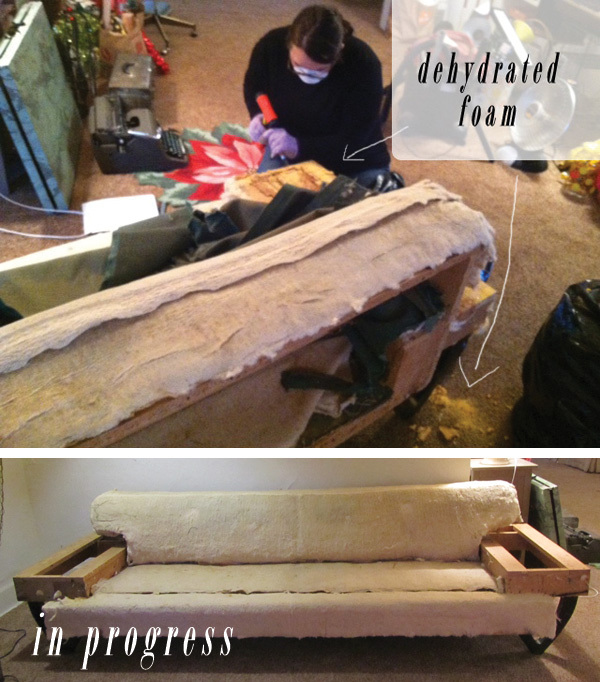 I added new foam to the bottom of the sofa, creating a better, comfy seat without having the cushions that would end way too high. Also, there is new foam in the arms and wrapped with dacron, as well. I decided that covering the arms with box pleats really worked the best and I like how clean and simple they look. On the front of the sofa, I wanted to add a little detail as it looked a little bland without cushions or anything on the front. Chris cut me a long strip of masonite which I then covered with dacron and the upholstery fabric. I really like this added detail. Whenever I take on new projects I'm always scared the outcome won't be exactly what I want. I'm really pleased that throughout this process of upholstery, I felt two steps ahead of it (usually it's visa versa). I knew there were design elements that I wanted to change, and I had the knowledge of how to make those changes. I really feel like I'm coming into my stride with re-upholstery, it's been lots of hard work, but ultimately very rewarding. 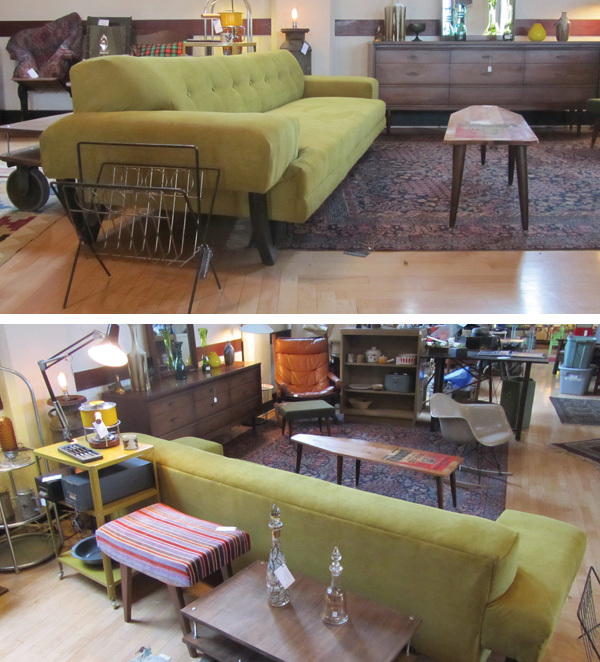 The sofa was sold at Vintage Design Collective, 7126 SE Milwaukee Ave, Portland, OR and on etsy. Very beautiful work. 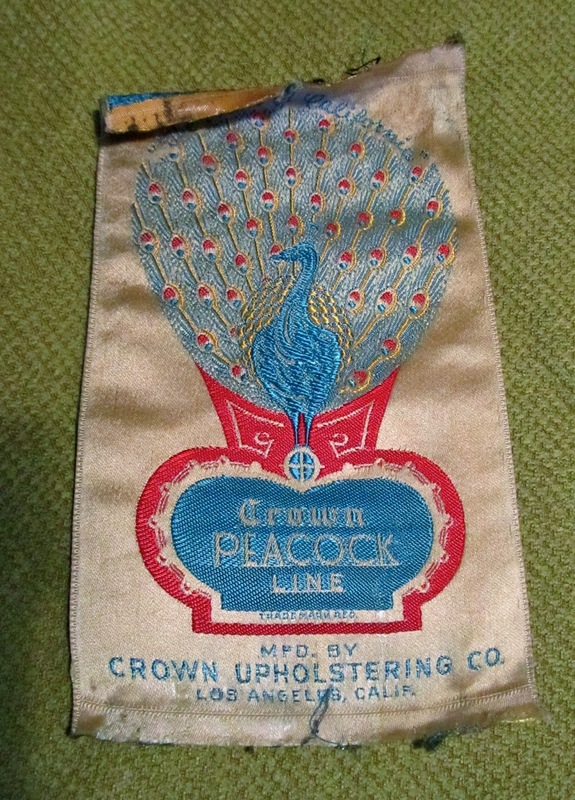 Today, we noted the Crown Peacock label beneath the cushions of a 1950 sectional we have inherited...ironically just up the street from Reed College...kind of in the same area as Vintage Design Collective.